Oreos. The classic Sandwich cookie that everyone knows and loves. Are you a classic Oreo lover or maybe you’re like me and you get excited for all the seasonal flavors like Gingerbread. Maybe you’re more into the Coconut Oreo Cremes… yeah, those are pretty awesome or even the Berry Oreos for all the crazy cool people. At the end of the day though, my absolute faaaavorite Oreo, it’s the Golden Double Stuff! There’s just something about it and the rest just don’t compare. 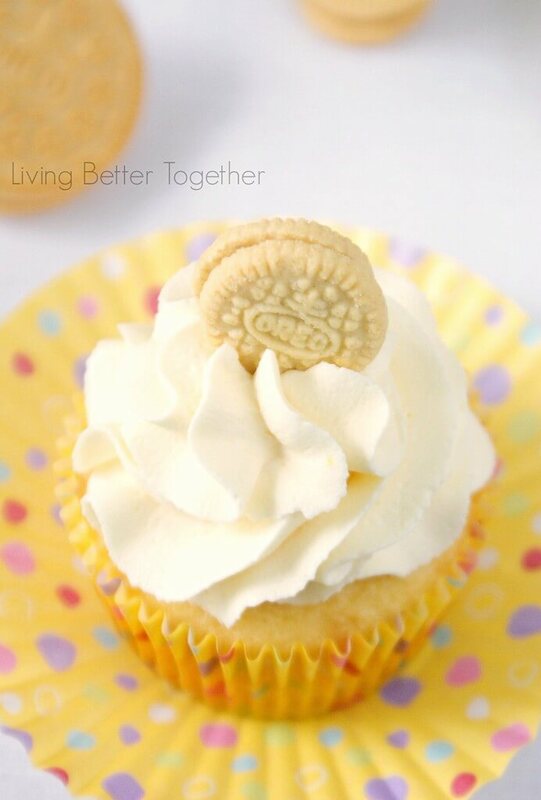 I made some Oreo Overload Cupcakes a couple months ago for my mom’s office and they were a huge hit – don’t worry, they’ll be on the blog soon enough – and I thought to myself, why not Golden Oreo Cupcakes? Sure, some may say it’s not as good, but they’d be wrong… just trust me on this one, mmmkay? 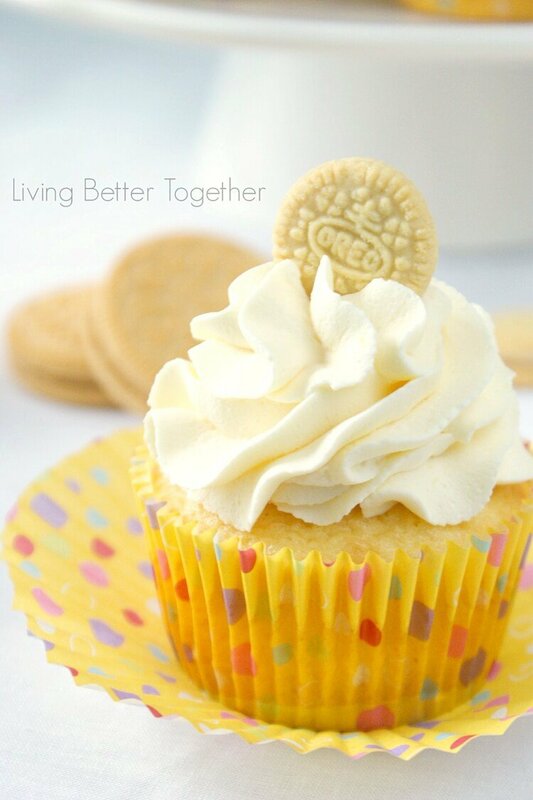 There’s something purely delicious about a simple golden yellow cupcake with a vanilla creme frosting and a Golden Oreo as it’s base. And let’s not forget that adorable baby Oreo on top to finish it off! 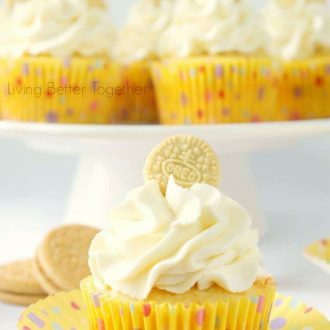 Now, even though the yellow cake and vanilla cream frosting have the flavor and makings of a delicious Golden Oreo, you probably shouldn’t dip it in milk. However, keep a glass close at hand when you’re enjoying these and you’re sure to get the full milk and Oreo experience! I made these for the guys when they returned from their day trip and when Matt got home and one of his friends took a bite of his cupcake, he exclaimed “Is there a cookie in this cupcake!? Matt, go kiss your wife”! I’m going to assume he liked it! I made these Strawberries & Cream Cupcakes for them last time and these Cookie Butter Cream Pie Bites the time before that! 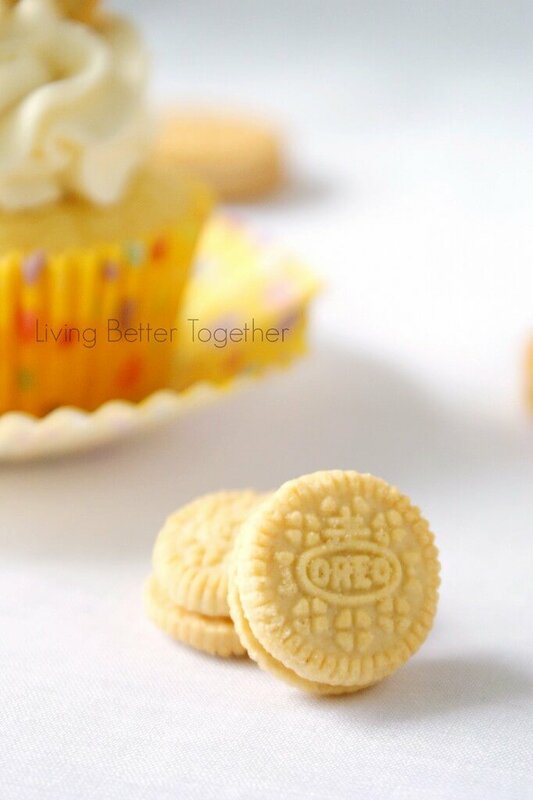 Do you have a favorite Oreo flavor or a favorite recipe you use Oreos in? I’d love to hear about it! 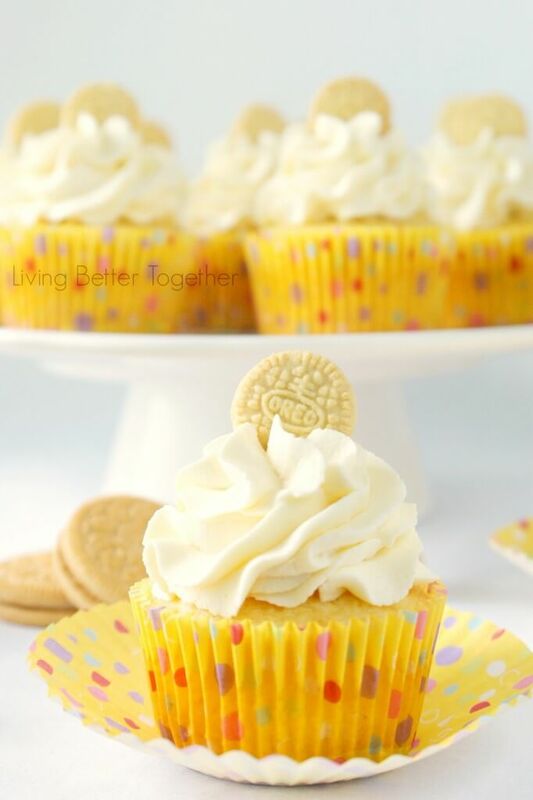 Delicious Yellow Cupcakes with a Vanilla Creme Frosting and a Golden Oreo Base! 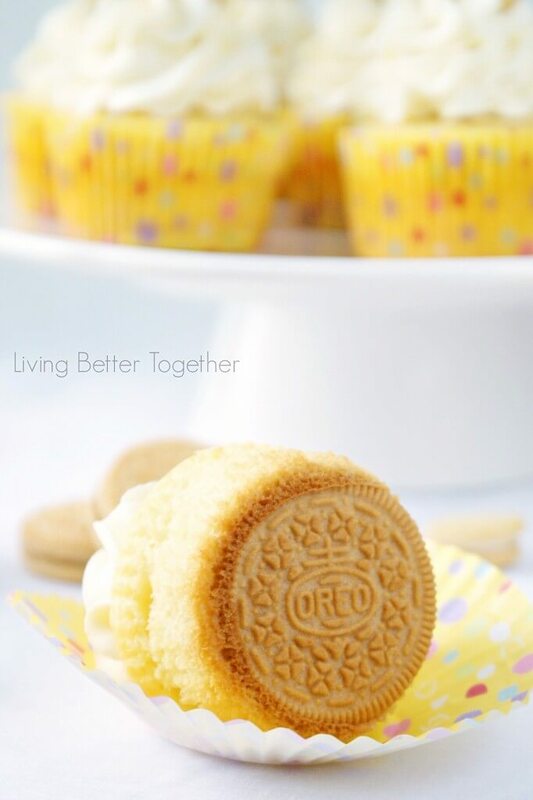 Line cupcake pan with liners and place a Double Stuff Oreo in each liner. 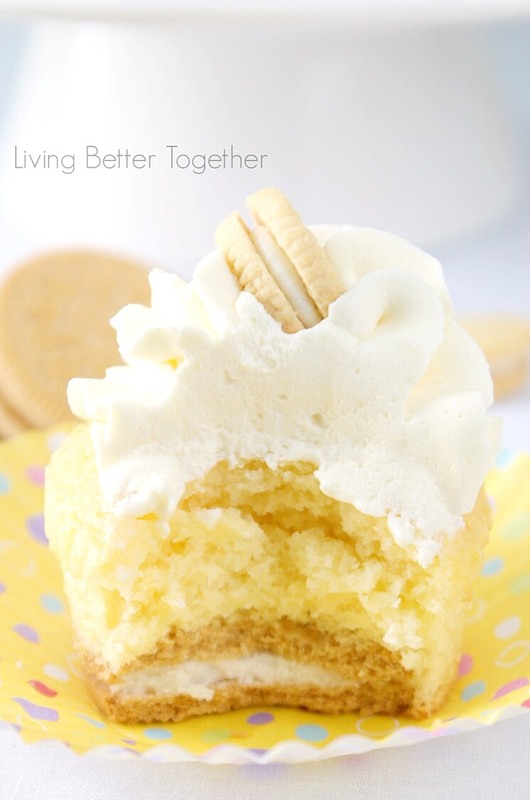 Combine all cupcakes ingredients in a large bowl or stand mixer and beat until combined. Add 1 1/2 tbsp of batter to each liner (make sure the Oreo is in it!). Turn heat down to 350 F.
Bake for 20-22 minutes until toothpick comes clean. Combine frosting ingredients in a large bowl or stand mixer and beat until fluffy, about 3 minutes. Pipe onto cupcakes and top with a mini Oreo. I love the Root Beer Float one, have your tried that yet? but I always gravitate back towards the golden!